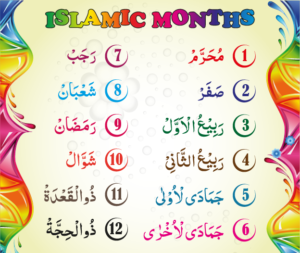 Seventh month of the Islamic Calendar. Meaning: From Rajaba “to respect”. Another one of the sacred months in which fighting was forbidden prior to Islam. This was one of the most respected months for the Arabs. It is also called Rajab al Fard. Fard means alone; because the other three sacred months come one after another, except this month. It comes alone not like the other 3 consecutive sacred months. 1. The Holy Prophet ascended to Heaven on the 27th of Rajab on either Sunday or Monday (Mi’raaj). 3. The battle of Tabook took place in the year 9 A.H. This was the last battle in which the Holy Prophet participated. Imam Abu Hanifa (R.A) passed away on the 15th of Rajab 150 A.H.
Imam Shafi’ee (R.A) passed away on the 14th Rajab 204 A.H.
Imam Muslim (R.A) passed away on the 24th of Rajab 261 A.H.
Imam Nawawee (R.A) passed away on the 14th of Rajab 677 A.H.